The Czech soprano Jarmila Novotná was among the brightest stars on the world opera stage of the 20th century. Though the Prague audience was captivated by her youthful charm and a distinctive voice, she made an important decision to continue her education. Her studies in Italy were possible only thanks to the support of T. G. Masaryk, who – with his family – became a close friend of Jarmila Novotná. The Italian studies ended by a triumph in the role of Gilda (“Rigoletto”) in Verona’s Arena and she entered the international scene. She performed in many opera houses all over the world; Vienna, Berlin, Salzburg, Paris, Milan… The Metropolitan Opera in New York became her home stage for sixteen seasons, she played many interesting characters there. Her Mařenka in “The Bartered Bride”, Violetta in Verdi’s “Traviata” or Gilda in “Rigoletto”, an excellent double role Olympia/Antonia in “Les Contes d’Hoffman”, Cherubino in “Le Nozze di Figaro” or Octavian in “Der Rosenkavalier” were some of her unforgettable roles. She was a student of Emmy Destin. In June 1925 when only seventeen Jarmila Novotná made her debut in the National Theater in Prague as Mařenka in Smetana’s “Bartered Bride”. Violetta in “Traviata” or Rosina in “Il Barbiere di Siviglia” followed on the same stage. She became a regular member of the ensemble and portrayed 9 other roles (i.e. Jitka in “Dalibor”, Mlada in “Šárka”, Ännchen in “Der Freischutz” or Mimi in “La Boheme”). 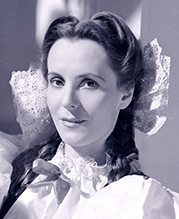 Jarmila Novotná returned to the National Theatre in the role of “Rusalka” before the beginning of the WWII after becoming a renowned European star. She accepted an invitation from the conductor Otto Klemperer to perform in Berlin in 1929, where she took the parts of Concepción (“L’Heure espagnole” by Ravel), Mařenka (in German), Gilda and Cho-cho San. She proved successful as Violetta in the opera house “Unter den Linden” or the Queen of the Night in the Charlottenburg theatre. Much of her repertoire consisted of contemporary music. She cooperated with the progressive director Max Reinhardt, who influenced her very much. Before the national-socialistic propaganda ended her Berlin career, she starred as a beautiful Helene in Offenbach’s “La belle Helene” and Antonia in “Les Contes d’Hoffmann”. As Guiditta by Franz Lehár she won the favor of the Viennese audience in the world premiere. She was lucky to perform her creations of Mimi, Violetta, Butterfly, Gilda or Mařenka. Her triple role of Olympia, Antonia and Giulietta in one performance in “Les Contes d’Hoffmann” amazed the audience. Vienna honored her with a precious title “The Chamber Singer” and Novotná came to support the renewal of the State Opera damaged building in return after the war. She performed the parts of Cherubino (“La Nozze di Figaro”) and Octavian (“Der Rosenkavalier”) at the Salzburg Festival in 1937. She was a close friend to Arturo Toscanini, under whose baton she sang as Pamina in The Magic Flute for the first time. Their friendship was crucial for her career. Another chance to make an appearance at this festival came after the war. She sang Octavian and Eurydice there in 1949. The original idea to perform at the World’s Fair Exhibition in New York in 1939 did not work out, but Toscanini introduced Novotná to the Metropolitan Opera (MET). She got a promise to sing in “The Batered Bride” there. She and her family arrived in New York as citizens of a country under military occupation. The role of Mimi was her debut in the MET. “Bartered Bride” in English raised excited ovations and the MET ensemble presented it on tour. In total she appeared 193 times at the Met in very stylish, diverse roles. With her stay of 16 years, Jarmila Novotná broke the record of only two predecessors Emmy Destin and Maria Jeritza. She participated in a large array of benefit concerts, tours and guest appearances on the American continent which numbered in the hundreds. Always elegant, always attractive, Jarmila Novotná had many admirers and suitors. She captivated famous artists with her charisma and conquered Hollywood. She became a very famous, media monitored personality. Friends with important politicians, business people and aristocracy, Jarmila Novotná built her career with a professionalism and single-minded attitude. She would have been an exemplary role model for the feminist movement even today. Despite being expelled from the Czechoslovak and European stages by the Nazis, she never turned her back on her country. During the World War II, she took part in some actions and events to promote Czechoslovakia. She ended her concerts by singing the Czechoslovak anthem to standing ovations. Accompanied by Jan Masaryk on the piano, she recorded the Songs of Lidice, which became the artistic symbol of national resistance. She presided over the Czechoslovak Division of the US Red Cross. The Czech audiences saw her again in May 1946 when she performed for the Red Cross concert in the National Theatre. Later she made an appearance as Mařenka, Violetta, and as Tatiana – in November 1947 it was for the very last time. During the February putsch, her home residence, and another property was confiscated and she was forced to leave the Czechoslovakia for the USA. She never turned her back on her country. She regularly returned to her homeland after the Velvet Revolution in 1989 to actively support the musical life of the country. She founded the Jarmila Novotná Prize for young female opera singers. In 1991, the President Václav Havel decorated her with the State Order of Tomáš Garrigue Masaryk. The title of her memoirs alone is proof of her strength and stamina. They are called “Byla jsem šťastná…” (I Was Happy…). Jarmila Novotná passed away peacefully on February 9, 1994 in New York. The urn with her remains can be found in the Daubek family mausoleum in Liteň, the Czech Republic.